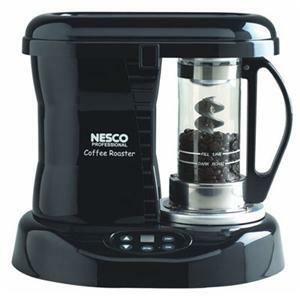 Nesco Professional Coffee Bean Roaster... The NESCO Pro Coffee Bean Roaster is a coffee enthusiast's dream, bringing the freshness and quality of roasting fresh gourmet coffee to your home. NESCO's Patented Catalytic Converter is the beginning of a new era in coffee history and a major step in the return of great tasting coffee to your home. Once you've experienced the flavor of fresh gourmet coffee roasted like this you'll want to share it with everyone you know. You'll be surprised to learn how fast and easy it is to roast your own specialty coffee beans right at home. Roaster creates an even roast and uniform color while controlling the roast from light to dark. It is fast and economical --- roasts a batch of beans in less than 20 minutes at half the cost of store-bought. Craft Your Own Signature Coffee from Your Favorite Bean Combination, Achieve a Wide Range of Distinct Flavors. It's Fun and Easy. Roast up to 1/3 lb of Beans in only 20 to 30 Minutes, that's enough for 36 cups of Coffee. FEATURES: Advanced Patented Catalytic Technology Significantly Reduces Smoke and Odor; Underwriters Laboratories Listed; 800 Watts.